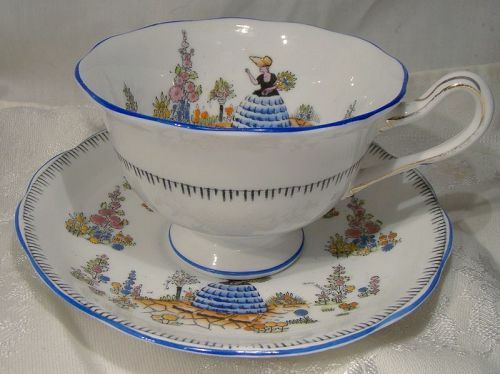 A Royal Albert Crown China Dainty Dinah 7694A blue trim cup and saucer from the1930s. 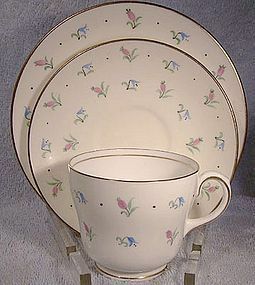 This cup has hand painted highlights, it is in the Avon shape and it has the backstamp in use from 1927-35. This 2-1/2" tall cup and matching 5-1/2" saucer are in excellent condition with no chips, cracks, crazing, damage or repairs other than a slight hint of gold wear on the handle. All items are thoroughly and conservatively graded and all condition issues are noted; all items are vintage or antique and may have slight signs of gentle use. Tracked Packet shipping to anywhere in the U.S. is $15.50 - this includes online tracking, air service and insurance up to $70. Items paid with a credit card will be shipped to confirmed addresses only. We do ship internationally. All of our prices are in $US. PLEASE NOTE: We DO NOT accept PayPal. 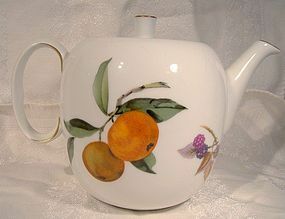 A fine English porcelain 5" tall teapot in the Evesham pattern, issued by Royal Worcester. This has fruit decoration with gold trim, and it is in excellent condition with no chips, cracks, crazing, losses, damage or repairs. All items are thoroughly and conservatively graded and all condition issues are noted; all items are vintage or antique and may have slight signs of gentle use. Expedited tracked and insured parcel shipping to the U.S. starts at $24 (other spots may vary, air is higher). Items paid with a credit card will be shipped to confirmed addresses only. We do ship internationally. All of our prices are in $US. PLEASE NOTE: We DO NOT accept PayPal. A trio in the English bone china S123 pattern made by Wedgwood. This trio features handpainted bluebells and pink buds, and it consists of the 2-3/4" tall cup, the 5-7/8" saucer, and the 6-7/8" bread and butter plate. This trio is in excellent condition with no chips, cracks, crazing, losses, damage or repairs. All items are thoroughly and conservatively graded and all condition issues are noted; all items are vintage or antique and may have slight signs of gentle use. Surface insured shipping to the U.S. is $13 (other spots may vary) - insured is higher, and mandatory on items over $95 if paid with a credit card. Items paid with a credit card will be shipped to confirmed addresses only. We do ship internationally. All of our prices are in $US. NOTE: we DO NOT accept PayPal, only VISA and MASTERCARD. A scarce sterling silver 3-3/4" child's fork and matching 3-1/8" child's spoon in the sterling silver flatware Saxon pattern, issued by Birks. This set has an L monogram on each piece and it weighs 39.0 grams. It is in excellent condition with no dents, bends, corrosion, losses, damage or repairs. All items are thoroughly and conservatively graded and all condition issues are noted; all items are vintage or antique and may have slight signs of gentle use. Small packet air shipping to the U.S. starts at $9.50 (other spots may vary). Items paid with a credit card will be shipped to confirmed addresses only. We do ship internationally. All of our prices are in $US. PLEASE NOTE: We DO NOT accept PayPal, only VISA and MASTERCARD. 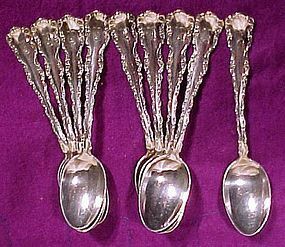 A set of nine 4" long sterling demi-tasse or espresso spoons in the Ryrie Birks Louis XV pattern. These spoons have a single gothic monogram - I am not good at deciphering these letters, but it may be an I or an L. They are not the thin pressed-out sterling spoons, they are proper weight demitasse spoons (weight approximately 102 grams), and they are in excellent original condition with no dents, bends, pattern wear, corrosion, losses, damage or repairs. All items are thoroughly and conservatively graded and all condition issues are noted; all items are vintage or antique and may have slight signs of gentle use. Expedited tracked and insured parcel shipping to the U.S. starts at $22 (other spots may vary, air is higher). Items paid with a credit card will be shipped to confirmed addresses only. We do ship internationally. All of our prices are in $US. PLEASE NOTE: We DO NOT accept PayPal, only VISA and MASTERCARD. A vintage dinnerware trio in the India Tree pattern by Copeland Spode. This tableware item consists of the 2-5/8" high cup, the 5-3/4" saucer and the matching 6-1/2" bread and butter plate. This trio is a vintage issue of the pattern that was produced from 1879-1994 and by the mark it dates to the pre-1920 era. It is in the orange and rust colourway with a scalloped edge, and this fine table setting is in excellent condition with no chips, cracks, crazing, losses, damage or repairs. This item is in excellent condition with no chips, cracks, dents, bends, corrosion, losses, damage or repairs. All items are thoroughly and conservatively graded and all condition issues are noted; all items are vintage or antique and may have slight signs of gentle use. Small packet air shipping to the U.S. starts at $16.50 (other spots may vary). Items paid with a credit card will be shipped to confirmed addresses only. We do ship internationally. All of our prices are in $US. PLEASE NOTE: We DO NOT accept PayPal, only VISA and MASTERCARD. 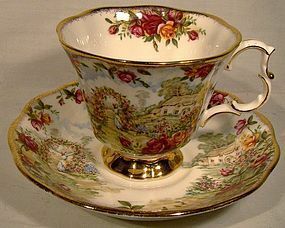 A R. Albert Old Country Roses 25th Anniversary cup and saucer. 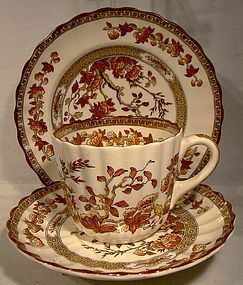 This scarce Royal Albert English bone china 3" tall cup and matching 5-1/2" saucer issued in 1986 "To celebrate the 25th Anniversary of Old Country Roses". This cup and saucer is in excellent condition with no chips, cracks, crazing, losses, damage or repairs. All items are thoroughly and conservatively graded and all condition issues are noted; all items are vintage or antique and may have slight signs of gentle use. Tracked Packet shipping to anywhere in the U.S. is $14.50 - this includes online tracking, air service and insurance up to $70. Items paid with a credit card will be shipped to confirmed addresses only. We do ship internationally. All of our prices are in $US. PLEASE NOTE: We DO NOT accept PayPal. A scarce 5-1/4" sterling silver five-tined sardine fork in the Chester pattern, introduced by International in 1900. This serving piece weighs 18.7 grams and it is in excellent condition with no monograms, dents, bends, corrosion, losses, damage or repairs. All items are thoroughly and conservatively graded and all condition issues are noted; all items are vintage or antique and may have slight signs of gentle use. Small packet air shipping to the U.S. starts at $9.50 (other spots may vary). Items paid with a credit card will be shipped to confirmed addresses only. We do ship internationally. All of our prices are in $US. PLEASE NOTE: We DO NOT accept PayPal, only VISA and MASTERCARD. 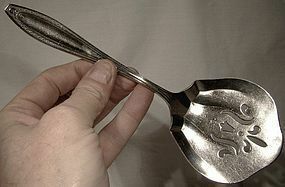 A 9-3/4" sterling handled pie lifter or server with a stainless blade. This lifter is stamped STERLING with a W. maker's mark (we have been unable to identify the maker or pattern), and this fine flatware serving piece is in excellent condition with monograms, dents, bends, corrosion, losses, damage or repairs. All items are thoroughly and conservatively graded and all condition issues are noted; all items are vintage or antique and may have slight signs of gentle use. Small packet air shipping to the U.S. starts at $9.50 (other spots may vary). Items paid with a credit card will be shipped to confirmed addresses only. We do ship internationally. All of our prices are in $US. PLEASE NOTE: We DO NOT accept PayPal, only VISA and MASTERCARD. 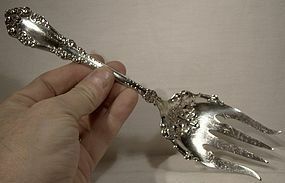 A large 9" silverplated cold meat serving fork in the Berkshire pattern, introduced by International in 1897. This fork is in excellent condition with no monograms, dents, bends, corrosion, losses, damage or repairs. All items are thoroughly and conservatively graded and all condition issues are noted; all items are vintage or antique and may have slight signs of gentle use. Small packet air shipping to the U.S. starts at $9.50 (other spots may vary). Items paid with a credit card will be shipped to confirmed addresses only. We do ship internationally. All of our prices are in $US. PLEASE NOTE: We DO NOT accept PayPal, only VISA and MASTERCARD. 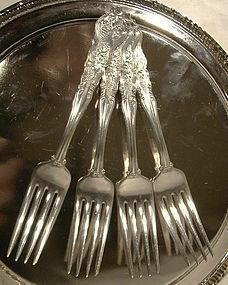 A group of four 7" silver plated luncheon forks in the International Moselle flatware pattern (1906-56). These forks are in fairly good condition with no monograms, pattern wear, corrosion, pitting, damage or repairs, but please note there is minor heel wear on the back of some of the forks, and the tine ends show wear to outer tines. Otherwise the silver plating and pattern is intact. All items are thoroughly and conservatively graded and all condition issues are noted; all items are vintage or antique and may have slight signs of gentle use. Small packet air shipping to the U.S. starts at $9.50 (other spots may vary). Items paid with a credit card will be shipped to confirmed addresses only. We do ship internationally. All of our prices are in $US. PLEASE NOTE: We DO NOT accept PayPal, only VISA and MASTERCARD. 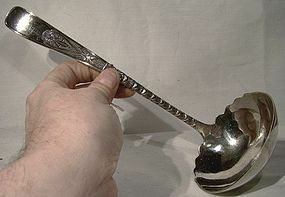 A finely decorated hand-engraved 6-3/4" sauce ladle in 800 silver by Germany's W.H. Wilkens & Sohne in the Ostfriesen pattern. This ladle weighs 50.1 grams, it has an FF monogram on the back of the stem, and it retains some gilding on the bowl's interior. This vintage serving piece is in excellent condition with no dents, bends, corrosion, losses, damage or repairs. All items are thoroughly and conservatively graded and all condition issues are noted; all items are vintage or antique and may have slight signs of gentle use. Small packet air shipping to the U.S. starts at $9.50 (other spots may vary). Items paid with a credit card will be shipped to confirmed addresses only. We do ship internationally. All of our prices are in $US. PLEASE NOTE: We DO NOT accept PayPal, only VISA and MASTERCARD. A sterling silver 5-1/8" (tip of handle to edge of bowl) gilt bowl cream ladle in the Oxford pattern, introduced by Gorham in 1895. This ladle weighs 16.9 grams, and it is in excellent condition with no monograms, dents, bends, corrosion, losses, damage or repairs. All items are thoroughly and conservatively graded and all condition issues are noted; all items are vintage or antique and may have slight signs of gentle use. Small packet air shipping to the U.S. starts at $9.50 (other spots may vary). Items paid with a credit card will be shipped to confirmed addresses only. We do ship internationally. All of our prices are in $US. PLEASE NOTE: We DO NOT accept PayPal, only VISA and MASTERCARD. 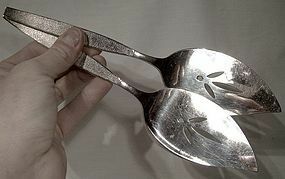 A vintage 4-1/4" long pair of sugar tongs in the Birks Regency Silver Plate Queen Mary pattern. This elegant serving piece is in excellent condition with no monograms, dents, bends, corrosion, losses, damage or repairs. It has not been monogrammed. All items are thoroughly and conservatively graded and all condition issues are noted; all items are vintage or antique and may have slight signs of gentle use. Small packet air shipping to the U.S. starts at $9.35 (other spots may vary) insured is higher. Items paid with a credit card will be shipped to confirmed addresses only. We do ship internationally. All of our prices are in $US. PLEASE NOTE: We DO NOT ACCEPT PayPal, only VISA and MASTERCARD. 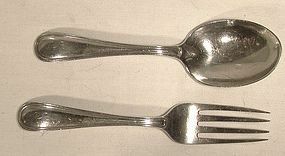 A pair of silver plated 9-3/4" fish servers in the Oneida Community Silver Sands flatware pattern, introduced in 1966. This pair is in excellent condition with no monograms, dents, bends, corrosion, losses, damage or repairs; they have a fine patina from use which is exaggerated in our halogen-lit pictures. All items are thoroughly and conservatively graded and all condition issues are noted; all items are vintage or antique and may have slight signs of gentle use. Tracked Packet shipping to the U.S. starts at $17 - this includes online tracking, air service and insurance up to $100. Items paid with a credit card will be shipped to confirmed addresses only. We do ship internationally. All of our prices are in $US. PLEASE NOTE: we DO NOT accept PayPal, only VISA and MASTERCARD. A pierced bowl 8-3/8" pea server in the silverplated Webster flatware pattern, introduced by Rogers Heirloom Oneida in 1915. This serving piece is in very good condition with no monograms, dents, bends, corrosion, losses, damage or repairs. All items are thoroughly and conservatively graded and all condition issues are noted; all items are vintage or antique and may have slight signs of gentle use. Small packet air shipping to the U.S. starts at $9.50 (other spots may vary). Items paid with a credit card will be shipped to confirmed addresses only. We do ship internationally. All of our prices are in $US. PLEASE NOTE: we DO NOT accept PayPal, only VISA and MASTERCARD. A lovely and ornate silver plated 11-1/4" soup ladle in the Assyrian pattern, introduced by Rogers International in 1889. This serving piece is in excellent condition with no monograms, dents, bends, corrosion, losses, damage or repairs. All items are thoroughly and conservatively graded and all condition issues are noted; all items are vintage or antique and may have slight signs of gentle use. Small packet air shipping to the U.S. starts at $15 (other spots may vary). Items paid with a credit card will be shipped to confirmed addresses only. We do ship internationally. All of our prices are in $US. PLEASE NOTE: we DO NOT accept PayPal, only VISA and MASTERCARD. 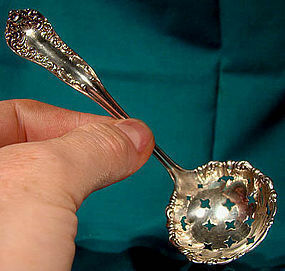 An International Diana sterling silver sifter spoon or ladle circa 1900. This 5" pierced bowl sugar sifter spoon or ladle is in the sterling silver Diana flatware pattern, introduced by International in 1900. This spoon is in excellent condition with no monograms, dents, bends, corrosion, losses, damage or repairs. All items are thoroughly and conservatively graded and all condition issues are noted; all items are vintage or antique and may have slight signs of gentle use. Tracked Packet shipping to anywhere in the U.S. is $14.00 - this includes online tracking, air service and insurance up to $70. Items paid with a credit card will be shipped to confirmed addresses only. We do ship internationally. All of our prices are in $US. PLEASE NOTE: We DO NOT accept PayPal.